Man Utd forward Marcus Rashford has confirmed that he’s left the England camp as he has continued to struggle with his foot injury. The 21-year-old took to Twitter, as seen below, to reveal that he was still being troubled by his knock and so he has left the squad ahead of the Euro 2020 qualifiers against Czech Republic and Montenegro. Further, England boss Gareth Southgate also commented on the situation during his press conference on Thursday, confirming that it is the same issue that Rashford arrived with at the start of the week. “Marcus has been with us all week and arrived with a problem with his foot,” Southgate said, as per the FA’s official site. That seems like the most sensible decision for all concerned, as ultimately neither Rashford nor his club or country want to aggravate the problem further and so if he wasn’t expected to feature in the coming days, then it is undoubtedly best that he returns to Carrington for treatment. The Red Devils have some crucial fixtures coming up, starting with their clash against Watford on March 30 as they continue to battle for a top-four finish in the Premier League while also preparing for their Champions League quarter-final showdown with Barcelona next month. 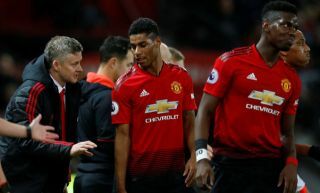 In turn, interim boss Ole Gunnar Solskjaer will be desperate to have Rashford available for selection as soon as possible, and so he will be concerned about his troublesome injury, but perhaps also delighted that he has been allowed to leave the England camp to continue his recovery. Rashford has scored 12 goals and provided nine assists in 38 appearances so far this season, and his goal threat coupled with his pace, movement and creative quality will be fundamental to United’s hopes of ending the season on a positive note in the coming weeks.